Here at LSOZI, we are going to take off every Wednesday for a look at the old steam/diesel navies of the 1859-1946 time period and will profile a different ship each week. These ships have a life, a tale all of their own, which sometimes takes them to the strangest places. – Christopher Eger. Here we see the forward 6″/47 (15.2 cm) Mark 16 mount of the Cleveland-class light cruiser (guided missile) USS Oklahoma City (CL-91/CLG-5/CG-5) dropping it like its hot on the heads of Viet Cong forces, “somewhere off the coast of South Vietnam,” in an August 1965 LIFE Magazine cover. At the time the 21-year old Okie Boat, as she was known, was one of the last WWII-era ‘gun cruisers” still afloat but she had been brought into the Atomic-era as a hybrid missile slinger and for nearly a generation served as the “Fighting Flagship” of the U.S. Navy’s Seventh Fleet in the Western Pacific, often coming in close just like this to rain fire and brimstone when called. She was part of the large and successful USS Cleveland (CL-55) class of light cruisers during WWII. Originally planned to be some 52-ships strong, 9 were carved off to become USS Independence class light carriers, while about half of the others were canceled as the end of the war was fast approaching. 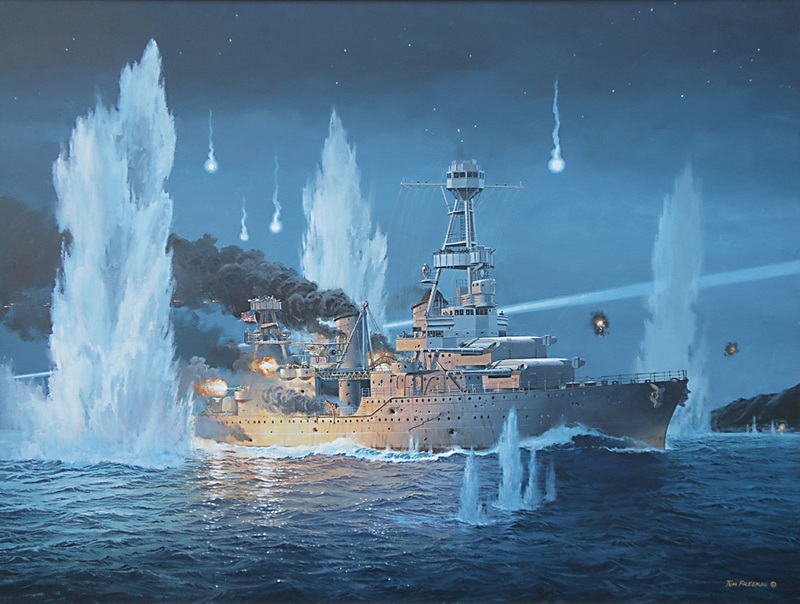 These were mighty “10,000-ton” designed light cruisers capable of making 32-knots while cruising some 14,500 nm at half that to reach those out-of-the-way Pacific battlegrounds without stopping for gas. USS Oklahoma City (CLG 5) View of the ship’s 6″/47 guns. 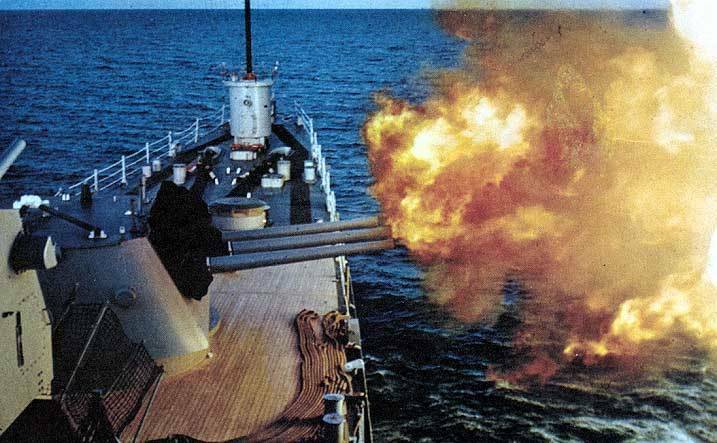 Photograph was received in August 1972 and was probably taken during naval gunfire support operations off Vietnam earlier in that year as the paint on the gun barrels is charred and blistered from the heat of firing. Official U.S. Navy Photograph, from the collections of the Naval Historical Center #NH 98680. Packing a dozen Mk.16 guns in four triple turrets each protected by 6-inches of armor themselves) these rapid-fire guns could bring an incredible amount of pain to enemy warships and land forces in a short time. As noted in prewar tests with these mounts, during gunnery trials in March 1939, USS Savannah (CL-42) fired 138 6-inch rounds in one minute. When you keep in mind that each of these guns fired a 130-lb. shell to 26,118 yards at maximum elevation, that’s pretty strong medicine. To augment this, these ships also carried a dozen 5-inch DP guns as well as an impressive AAA suite. USS Oklahoma City (CL 91) Underway in the Delaware River, while operating out of the Philadelphia Navy Yard, Pennsylvania, 9 April 1945. Courtesy of the U.S. Naval Institute, Annapolis, Maryland. 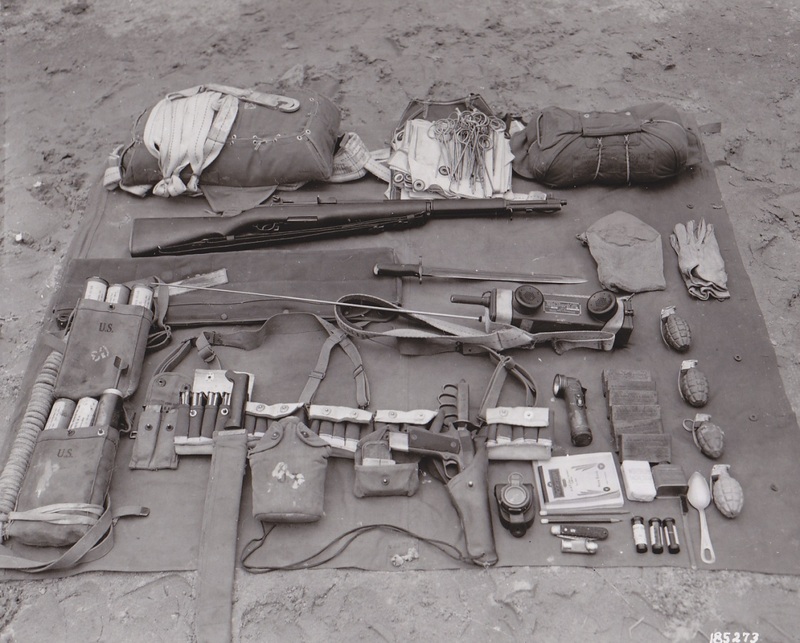 Collection of James C. Fahey. Official U.S. Navy Photograph, from the collections of the Naval Historical Center #NH 95753. Oklahoma City (as CL-91) was laid down 8 December 1942 by the Cramp Shipbuilding Co., Philadelphia, Pa. She was finally commissioned 22 Dec. 1944, with just nine months left in the World War. Rushing to the Pacific, she joined Carrier Task Group 38.1 by June 1945 and saw some hot service off Okinawa and in Japan’s home waters just before the end of the war. In the first of a stream of luck, she suffered no wartime casualties and won a battle star for her service. With a surplus of ships and a shrinking Navy, the gently used cruiser was mothballed 30 June 1947 where she sat for the next decade, often surrounded by her sisterships. While many of her sisters never saw active service again, the Okie was far luckier. In 1957, she began a three-year conversion to a guided missile cruiser to fire the gigantic Talos long-range surface-to-air missile system. 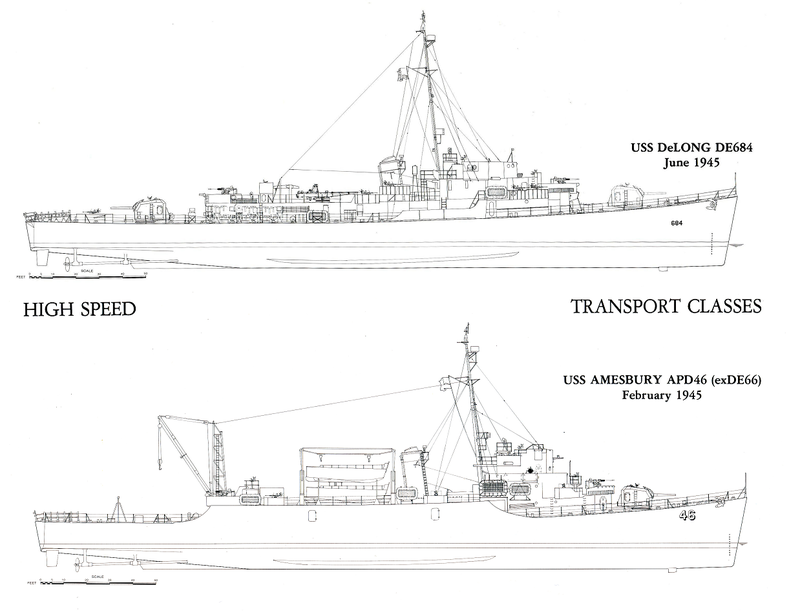 Two of her sisters, Galveston (CL-93/CLG-3) and Little Rock (CL-92/CLG- 4), both ironically also built by Cramp, were similarly converted. 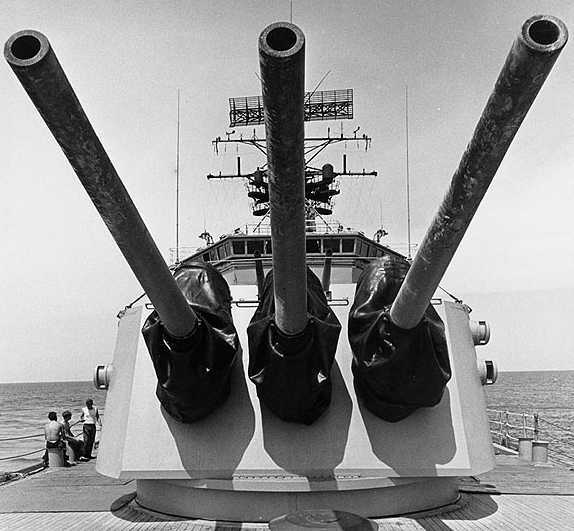 This conversion consisted of removing the two aft 6-inch mounts and their magazines to make room for the two-armed bandit Talos system and a below-deck magazine for 46 of the comically large (38-foot long 7800-pound) Bendix RIM-8 missiles. These beasts, to include a RIM-8D W30 nuclear-warhead version, could make Mach 2.2 and reach out to 100 nm– that made them among the best SAMs of the era. Forward of the bridge, the No.2 6-inch mount was replaced by a twin 5-inch DP to help offset the weight of all the added surface search radars, fire control directors and commo gear. Much of her WWII armament, such as the 20mm guns, and gear were ditched. Gone were her seaplanes, which had been retired a decade earlier anyway, and their catapults, replaced by deck space and refueling facilities for naval helicopters. Below decks, she (and Little Rock) was given extra room and facilities to support a fleet flag operation. All these extras pushed the boat to some 14,000-tons, which included additional ballast to help fight that 113-foot above deck height, all of which resulted in awful hogging in high seas and an increased draft to the near battleship-worthy 26-feet of seawater. Port bow view while underway, date and location unknown photo by Charles Lamm via Navsource. 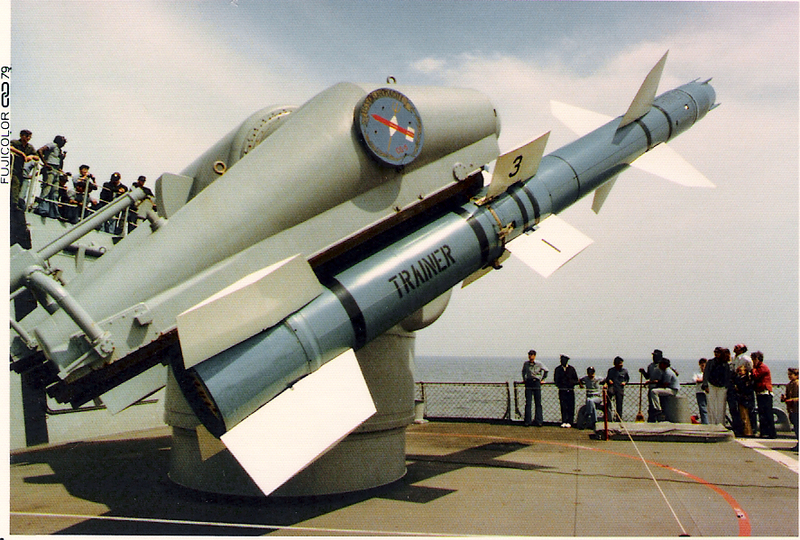 Note the twin 5-inch mount forward and the huge radar masts. 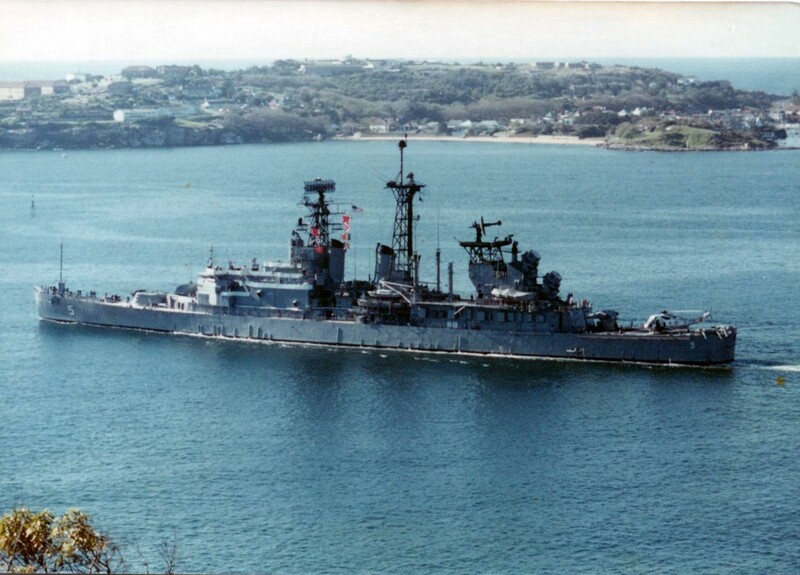 Recommissioned 7 Sept 1960, she became 7th Fleet flagship at Yokosuka, Japan that Christmas Eve. It was a job she would keep for much of her second career. From the Gulf of Tonkin include in August 1964 to the evacuation of Saigon in April 1975, she spent the majority of those ten+ years somewhere between the coastline of Vietnam, delivering gunfire support, and Yankee Station, providing air defense for the carriers stationed there. 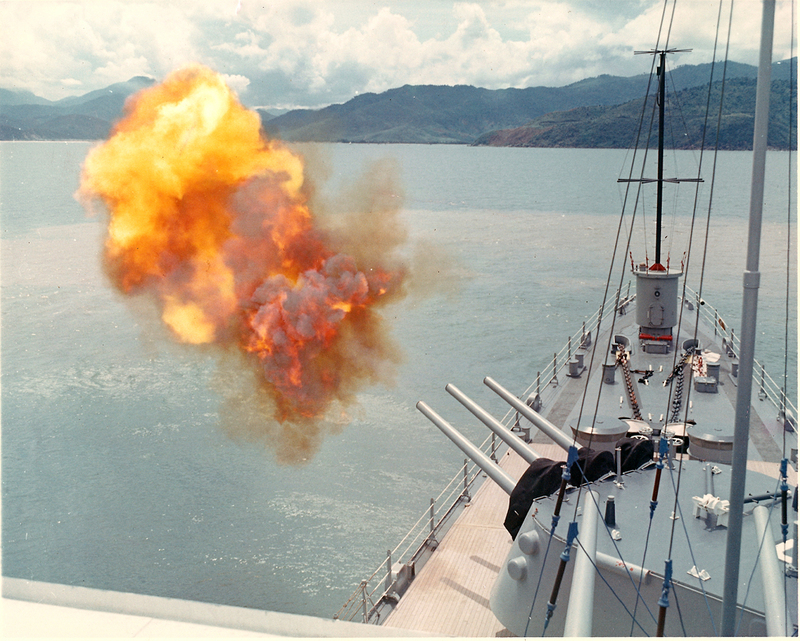 While Talos missiles splashed three North Vietnamese MIGs during the conflict, these came from other cruisers and not the Okie boat. She herself survived an attack by two MIG-17s on 19 April 1972. Her missiles did draw some significant blood however when she conducted the first surface-to-surface war shot in Navy history, destroying a NVA air control radar with a Talos RIM-8H anti-radar homing missile from fifty miles offshore. 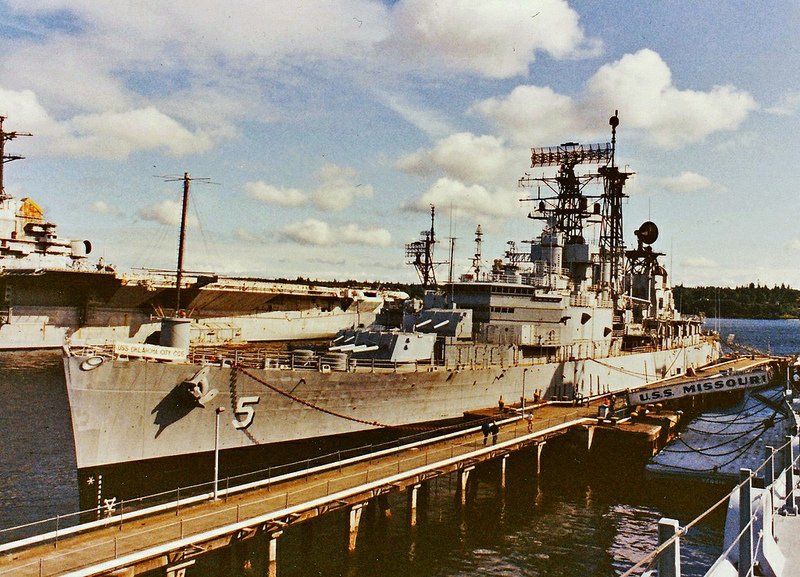 Port quarter view, underway in Sydney Harbor, Australia, late 1970s Barry A. Seward via Navsource. Note the Sea King on her pad. 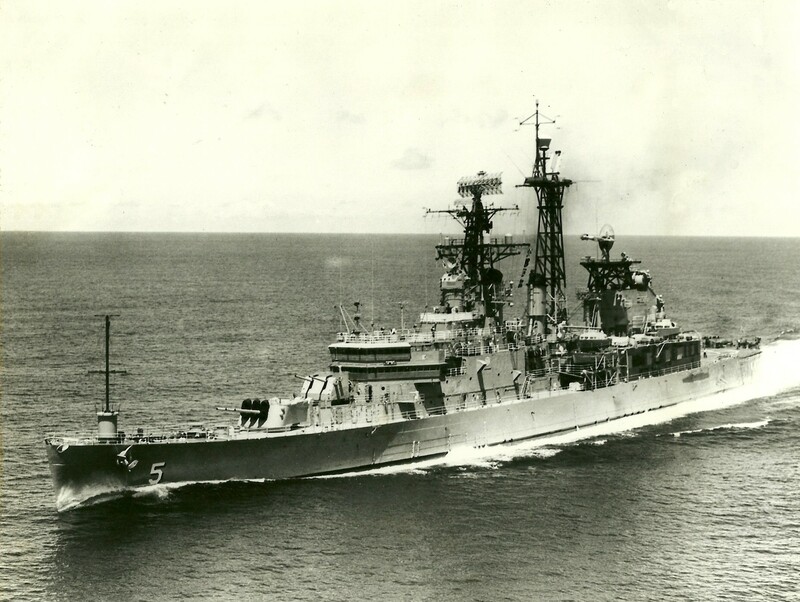 In all she earned 13 battle stars for Vietnam and by 1975, at age thirty, the lucky penny was well-worn but, with all of the other big gun ships of her era turned to scrap or laid up, she was an interesting niche. However, even having the 6-inch hood ornament only went so far. Her class had all been decommissioned by 1976 and her Talos missile system, designed in the 50s, was an Edsel in a world of AMC Pacers. Oklahoma City‘s last designation, applied at this time, was to simply drop the “L” from her hull number, making her CG-5. 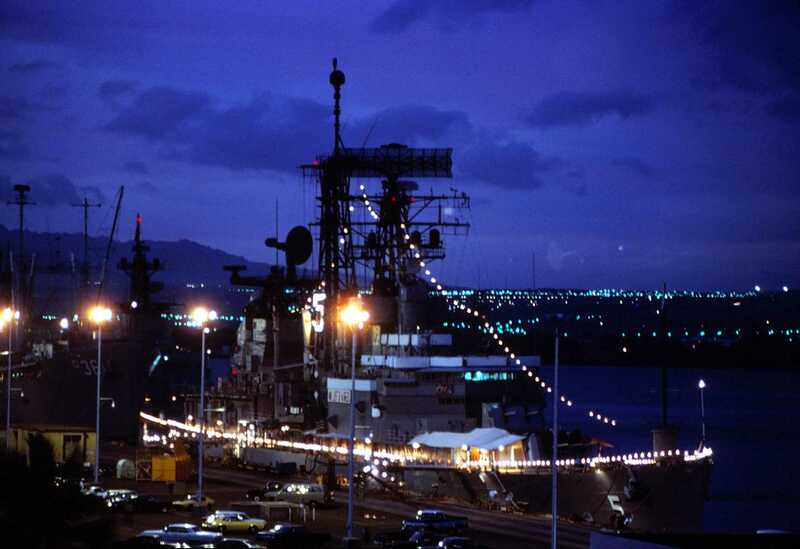 Moored at Pearl Harbor, HI, 18 October 1979 with friendship lights lit. 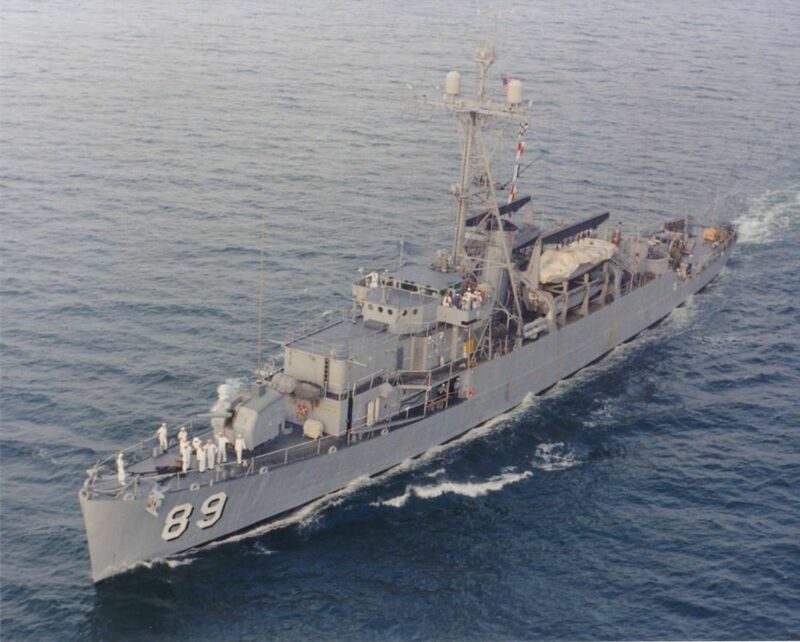 The “Okie Boat” was on her way to San Diego for decommissioning after serving as Flagship of the Seventh Fleet for eleven years. This picture was taken from the roof of the old Enlisted Barracks, which has since been torn down. Photo by Tom Bateman via Navsource. She had one more thing to before being decommissioned. 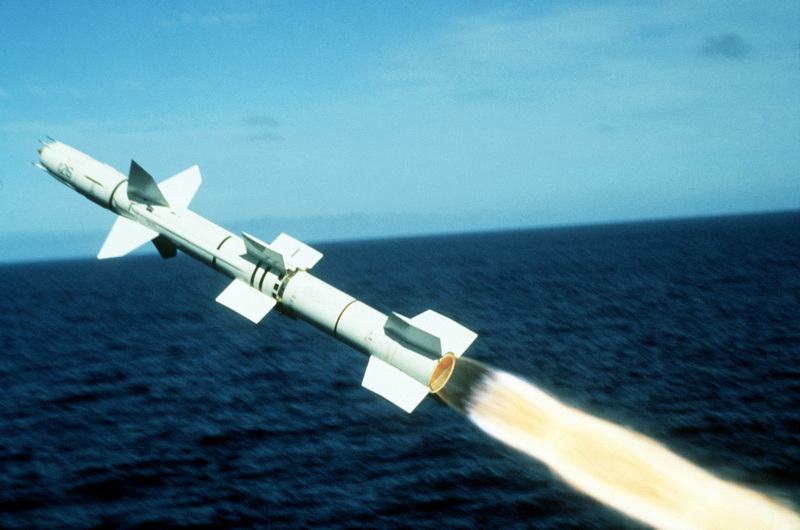 A view of a Talos surface-to-air guided missile, moments after being launched from the starboard side of the guided missile cruiser USS OKLAHOMA CITY (CG 5) at the Pacific Missile Test Range. This is the final firing of the Talos missile by the United States Navy conducted on 1 Nov 1979 National Archive# NN33300514 2005-06-30 by PH1 DAVID C. MACLEAN. 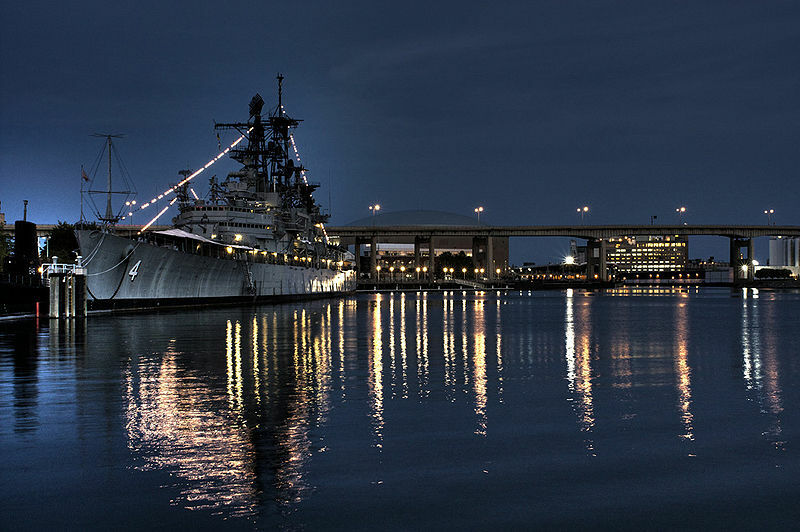 By 15 December 1979, she was decommissioned, the last WWII-era cruiser in the U.S. Navy on active service, and remained in mothballs for twenty years, contributing many of her parts to help recondition WWII era museum ships around the country. She spent 1979-99 in layup on red lead row. It was speculated by the Lehman-Reagan Navy of the 1980s of reactivating her for a third tour but funds were never allocated. 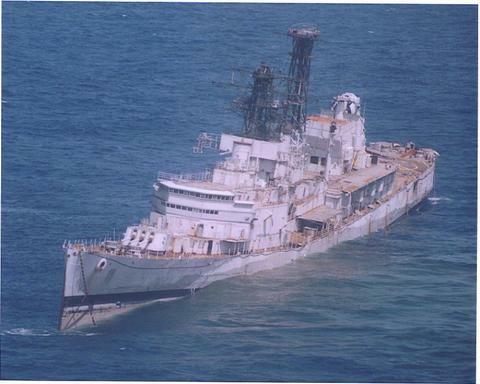 After 1989 ,with the Cold War over, it became open season on the salvage of minor parts for museum donation that went to help outfit her sister Little Rock as well as the USS Missouri. Finally, she was towed to deep water in February 1999 and subjected to a series of target shoots by U.S. and Allied fleets. The battered 44-year old was sent to the bottom by a final merciful SUT torpedo coup de grâce from the South Korean Navy Chang Bogo Type 209/1200 Submarine Lee Chun (SS-062) on 26 March 1999. Let us face it; she belonged in the 20th Century and it was better this way than to have her turned to scrap. Broken in two and headed to the bottom. 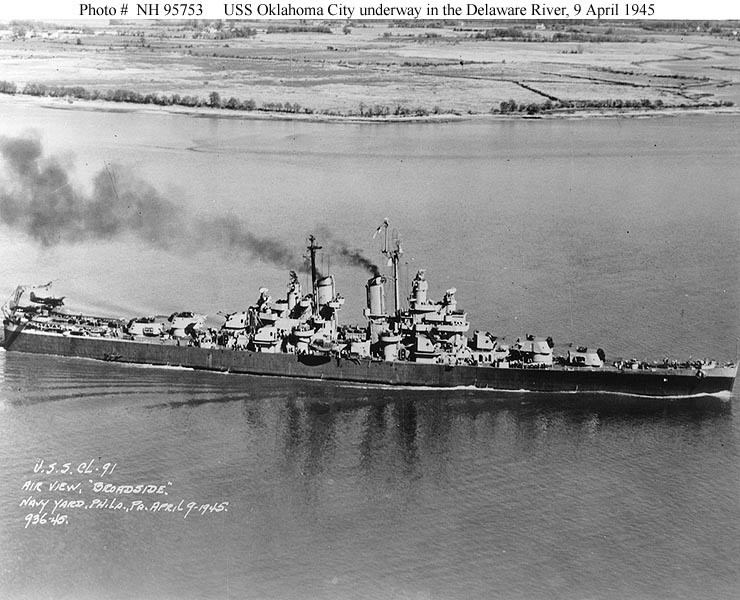 The memory of the “Fighting Flagship” is maintained by the Okieboat website as well as the USS OK City Association. As for her sisters, most of them had been long scrapped in the 1950s and 60s. Only three survived into the disco era, USS Springfield (CL-66/CLG-7/CG-7) who was decommissioned in 1974 and sold for scrap in 1980, USS Providence (CL–82/CLG-6/CG-6) who shared the same fate and timeline, and USS Little Rock (CL-92/CLG-4/CG-4) who was decommissioned in 1976 and is now a museum ship at Buffalo and Erie County Naval & Military Park. Please visit her if you have a chance. 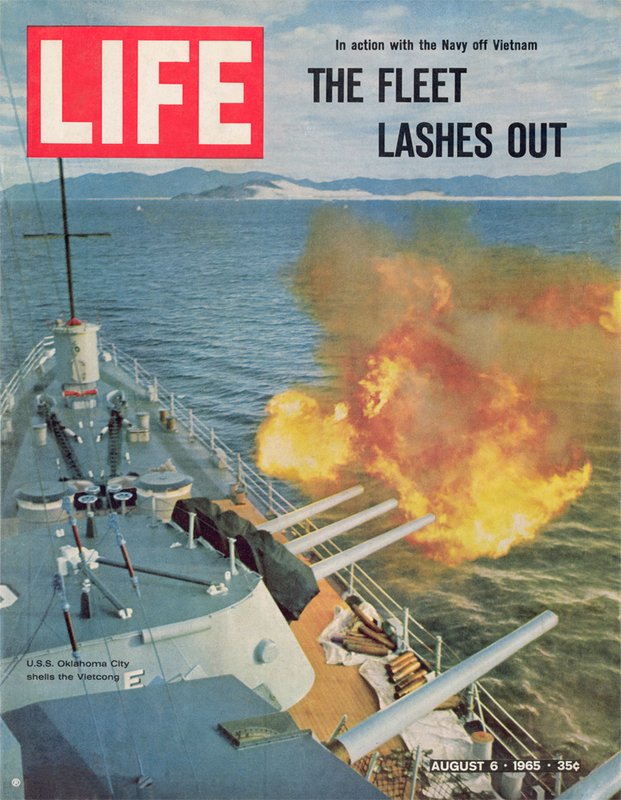 Nearing their 50th Anniversary, Warship International, the written tome of the INRO has published hundreds of articles, most of which are unique in their sweep and subject. Two of the photos are mine that I took. 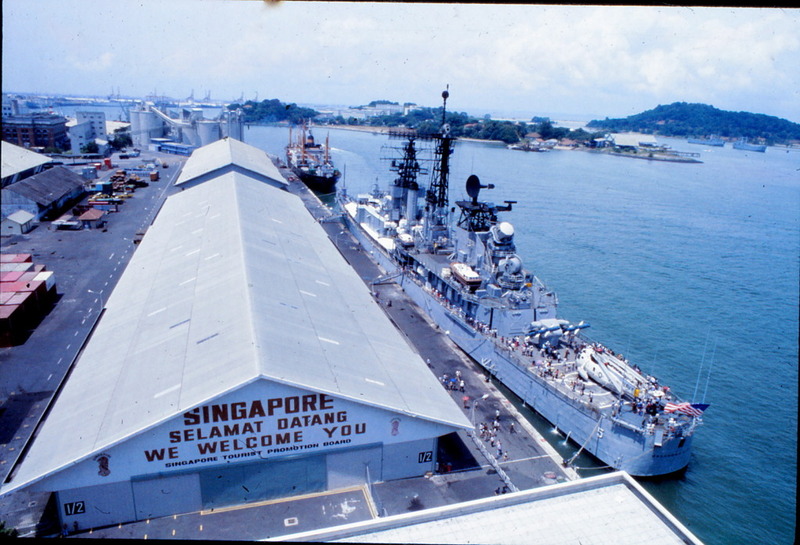 The talos mount and the elevated photo of the ship moored at Singapore. Done. What was your rank/rate (if you want to include it). Also, do you have a website you would like me to link? Also, thank you for your service, sir.